Construction on Droste Road in St. Charles continues. Traffic on this street has been reduced to two lanes. Jackhammers starting at 7:30 a.m., drilling that shakes houses and construction workers in and out all day have been a way of life for students living on Droste Road this year. And the noise will continue through the end of the school year, according to Tim Rohrbacker, the project manager. He said reconstruction is about 70 percent finished. Complications pushed the end date, which was supposed to be the end of last semester, to May 21. “It appears most of the possible delays are behind us at this point, and smoother sailing is expected is expected for the reminder of the project timeline,” Rohrbacker said. Construction on Droste began during the week of July 10, 2017. 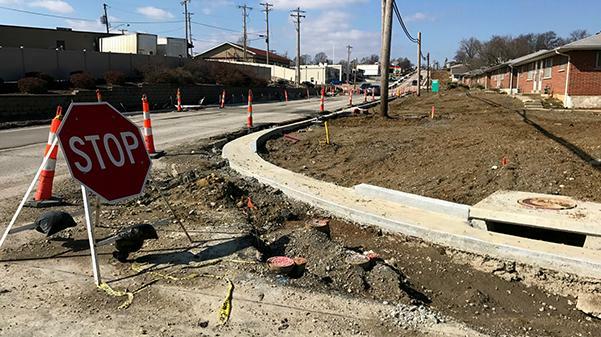 The reconstruction will stretch from Duchesne Drive to 300 feet before the West Clay Street intersection. Droste Road expenses have so far cost $5.2 million, which is just over $2 million more than the project’s original $2.17 million budget.